When initially robot-assisted laparoscopic surgery was introduced in urologic field, the focus was on radical prostatectomy and partial nephrectomy. It was quite true that upper tract urothelial carcinoma (UTUC), which had no major problem with laparoscopic operations, was late in the introduction of robotic surgery. One of the reasons for the late introduction of the robot for UTUC was difficulty in port placement due to relatively wide operation field. However, through various port arrangement modification, lots of UTUCs are treated with robot-assisted laparoscopic surgeries. 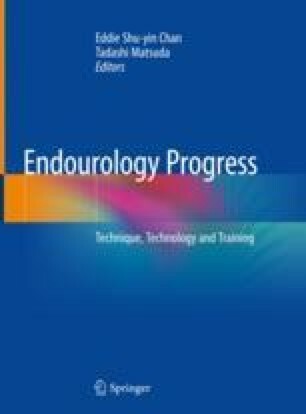 This chapter focuses on nephroureterectomy, the gold standard of UTUC treatment. We will discuss the preparation of robot-assisted laparoscopic nephroureterectomy, perioperative and oncologic outcome, and lymph node dissection, and will look into robotic LESS nephroureterectomy, which is a more advanced and less invasive than conventional robot surgery. We also look into what kind of robot-assisted laparoscopic surgery could be performed instead of nephroureterectomy when nephron saving procedure is needed.